One day after a good satisfying lunch, Don and I hitched an autorickshaw back to our office. The road on which we got the ride is a one-way and the autowallah was reluctant to come along, saying that his children will have to wait. We assured him that we knew a shortcut (that we did), and we would walk the rest of the way ensuring that he gets to his kids on time. 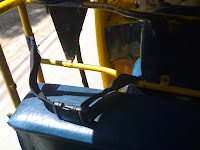 On seating in his auto, I noticed seat belts (yes, seat belts!!) on both sides of the auto. In Hyderabad, upto 6 children are allowed inside an auto. So, in order to maximize revenues, a lof of these drivers have put in a small wooden bench on the opposite side of the seats. This one was cushioned, and to take the cake with a seat belt. Although I seriously wonder, which thin kid must be seating in that position. Watching this, we decided to strike a conversation with the driver. The chappie was a friendly fellow who seemed to be genuinely concerned about the kids. In a market, where the customer is the king, how many service providers really go the distance and take pains to ensure that the end-customer is happy? The autowallah in this case has gone a step further than norms (and peers) and has tried to re-assure the customers (the parents) about the safety of his end-customers (the children). If the driver can do it, then why oh why cant all the bigger service providers follow suit? Refreshing. Now it's proved that the Pune rickshaw-wallahs are the worst :) Hydie rickshaw-wallahs are angels. BTW, have you sworn off the use of the apostrophe? @lucifer - How did u know? It's stands for "It is"
Its is a possessive pronoun. 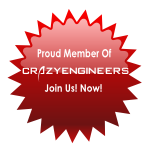 @lucifer - hmm, well if you do have to be so particular, then that becomes an obsessive thing! Being right is not being obsessive. Nowadays it's seeping in. I notice this exchange of "its" and "it's" even in official presentations and on TELEVISION! Plus I noticed the occurrence of "u" in a leading photography magazine a couple of months back. Go figure. How did Shakespeare feel when people started using "you" for "thou"?